This polyurethane pulley is used for the wood working / lumber industry. This custom designed part grasps planes of wood inside a high volume production machine. 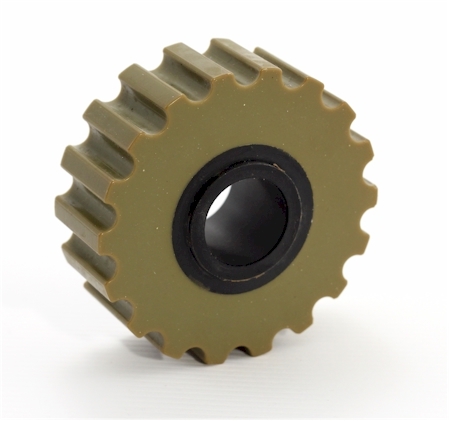 This polyurethane gear has a hard center core similar to nylon. The outside section is a non-marking outer area that holds the wood, but does not damage the product. Polyurethane is preferred by this customer because each component can be custom designed for hardness and flexibility suited to each production task. In addition, this polyurethane part has long service life and functions long after rubber and plastic parts have worn out. Our company creates custom polyurethane parts at low tooling costs for wood/lumber, mining, petroleum, manufacturing and other industries. All of these polyurethane components are designed to exacting standards. Each client project always begins with rapidly built prototypes created at low cost for evaluation and testing. We are able to manufacture both short or long term product runs. 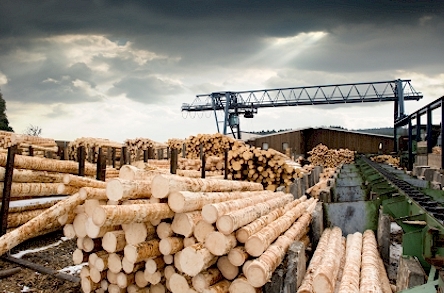 Polyurethane component parts are used by the wood / lumber industry because polyurethane is superior to other materials such as plastic, rubber and steel. Molded polyurethane parts offer high load and high compression abilities that function long after rubber and plastic parts have failed or worn out. Cast polyurethane parts can be made iron-strong or sponge-soft, in any color or shape. In addition, polyurethane components offer long run durability and extreme resistance to harsh environments of water, heat, solvents, chemicals and abrasion. American Urethane can create your custom designed component fast and for low tooling costs. We can develop prototypes very fast and at affordable price for testing and evaluation. We welcome both short and long production orders.